“A statement issued by the Guild said that a "top-down, one-way interaction in a country with limited internet connectivity and technological awareness cannot be the only answer for large masses of readers, viewers, surfers and listeners. Debate, dialogue and discussion are the essential ingredients of a democratic discourse… By delaying the establishment of a media inter-face in the Prime Minister's Office, in restricting access to ministers and bureaucrats in offices and in reducing the flow of information at home and abroad, the government in its early days seems to be on a path that runs counter to the norms of democratic discourse and accountability," it said. “I believe it’s very unfair to call it a ‘press meet’. 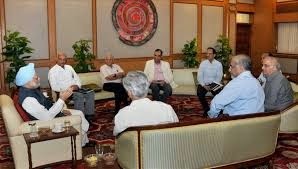 It looked like a luncheon meet of the ‘mob’ for a friendly discussion on the state of affairs of their turf. It’s strange you would think. A Prime Minister holds a press meet with five select editors from the print media and then needs to be defended by his own spokespersons. That is precisely what Manish Tiwari and Ambika Soni were doing on June 29. Is this the same nonsense that the Editors Guild is demanding now? Don’t forget, the same MMS held a previous meeting with only TV editors (in February 2011) as if they are some privileged class of royal durbaris. I am sure many will remember Harish Khare snubbing Arnab Goswami in that private meet telling him it is not an “inquisition” of the PM”. Barkha, who didn’t honour the PM with her presence then, later lamented that none of the editors talked about Pakistan. iRudali! It should also be remembered that on both the occasions MMS called editors only under the heavy burden of scams which he had to whitewash and not as a “routine” interaction. Unfortunately for the editor-mafia, Modi does not have any scams so far that he has to wash or defend. And Modi is absolutely right in keeping this mafia at a good distance. They are known to have twisted every word he has uttered in the past. Therefore, it is proper for the PM to speak directly speak to the people or communicate through social media. Some of these editors have also wanted the same social media dead or regulated. “According to Ajay Upadhyay, General Secretary, Editors Guild of India, the 15-member Working Committee includes Sachidanand Murthy, Raj Chengappa, Shravan Garg, Barkha Dutt, Coomi Kapoor, Shekhar Gupta, Jaydeep Bose, Sanjay Narayan, MK Razdan, Vijay Naik, Seema Chishti, Sheela Bhatt, and Kumar Ketkar, among others”. Some of these members belong in a rogues-gallery and not in any working committee of editors. They don’t deserve “Access” but the “Axe”. PS: You can now buy the book "Social media as watchdog" with Credit/Debit cards.. Please click on the image link of the book on the right margin of this page to follow the process..
You said it right. And your analogy, apt. We do believe, the Captain has ordered the course correction and is closely monitoring. Thank heavens, at long last, this Nation's mood is truly upbeat! You also forgot "secularism ka burqa" remark but no problem since the list is endless. Hopefully within next few years, young & honest journalists would take over and the present trash would be seen in the dustbin of history. Even if they intend to write a genuine apology letter, they must apologize not just for past sins but also for future sins. Because they are sure to tar Modi in the future too. Habits, you see, are tough to change. Ravi, excellent post. we the people request PM Modi to keep ignoring these editors as that is the best punishment for them. 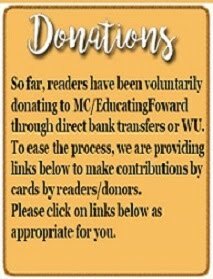 Let their(editor's) begging bowl held up. Fully agree with your view. In addition to ignoring these editor crooks, PM Modi should stop all the ads to commie English news papers and give only to vernacular news papers as necessary. Also, govt should minimise ad costs by extensively using YouTube videos and social media to a large extent. Excellent post and these EDITORS needs to be EDITED at earliest. I think Mr. Subramanian Swamy may be given the responsibility to represent Mr. Modi as Modi's media-interface !! U indeed left many things for many many sequels. None of the bricks of forth pillar wrote about degradation of PMO by SG as written in books by former secretaries, one love for family hard to wane. Any of the above mentioned 'a' list editors from the editors 'guilt' reading this blog - yes this comment is for you. Stop being geethads your disgrace is now a sympathy issue for the general public. Get a life. 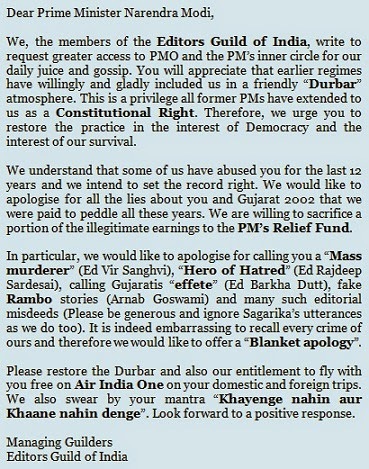 Their crimes are unpardonable even after the mock apology letter. They have poisoned the minds of people against RSS and Hindus in general while indulging the so called minorities. This has brought in a great divide in India which will take decades to heal. I respect a prostitute more. At least she only sells her OWN body for a living. This Editors” mafia is worse than Ebola infected entities. 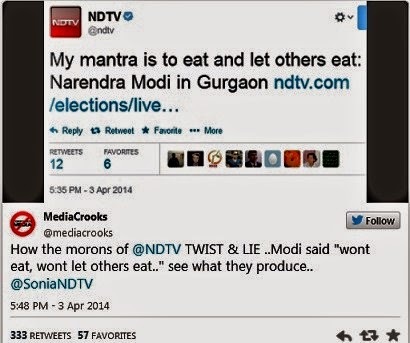 Modiji should keep away from the likes of Nation Destruction TV (NDTV) editors . Puppy episode was the first thing that came to my mind after reading the petition letter written by self praising Editors Guild of India. Isnt it ironical that those who , for the last 10yrs, were trying every dirty trick available in their bags to convert Indian democracy into a dynastic rule, are now giving lecture on democracy & transparency. One member of guild, worst than even a prostitute, kumar Ketkar was propagating on NDTV yesyterday that it is the arrival of emergency days under Modi. Why Mr. Ketkar? Is it because Modi is not allowing you to become a power broker, a dalal roaming in the corrodors of power ? This is exactly the role these paid journalists and editors were playing under Sonia/ Manmohan rule. But how long can Ravinar alone can keep on exposing them ?? What is modi sarkar doing about these evil people ?? They have more reach and they are doing inception of anti modi thoughts into the minds of fence sitter electorate's . And nobody from the government is doing anything about it . neither doing anything to reign in negative publicity nor anything to showcase how decisions are impacting the common man positively . Like it or not , in this world as of this point in time these people have more reach and they make the maximum noise . same lie repeated many times does tend to get halo of truth . Narendra Modi has to fix their improprieties. Ignoring them is no solution . You are right in way. But our support to Ravinar will not make his fingers fat and will keep his fingers busy on keyboard. On our part we remain alert and active on SM. One cannot ignore termites. And less said about truth winning the race, the better. It took 175 years for india to gain independence and 60 years ( or 50 years if you consider the previous NDA govt ) for nationalist party to ascend to power. Doing Nothing can never be a solution. Evil is shameless. Uses insults as 'cry wolf' to distract attention even as it continues its self indulgence. What Ravinar is doing is the right thing to people likes us get exposure a bit more carefully with his journalistic capabilities. gone are the days of Arun shourie, world moved on and pest in the garb of journalism has infested us. Now let me tell you Modi became PM not to score points against his detractors. he took this path for the betterment of the society at this point I think his priority is seriously fix the ills every person is facing. Once that is fixed his next will be these presstitutes, I mean by that time they will either get back to real journalism or go to the dustbin. He first thing avoided for 12 years used them when needed like a sorry to use that word though cndm, Sorry Ravinarji to even use that word. Yes we people want these presstitutes to be taken care of first but hi priority is different, he took care of them for the last 12 years, lets give him five years more. In between I hope Ravnar also may have a sittire how these people changed tunes, becauseI cannot miss Ravinar in this field. I feel and know for sure Ravinar does his job of real journalism and keep even Modi govt on tenterhooks. Only dissappointment is why we dont have multiple ravinars and give us more information to us everyday, as I keep comming back every hour and see nothing new, but still I am ok because I have so many people commenting who kind of think like me. this is not about proving a point to detractors. This is about survival and quality of life. The termites, pests, viruses, vermins do not care whether it is a five year mandate or what ones priorities are - if they are not controlled, reigned in - they will overwhelm one. As such these crooks of media still continue to spread poison , lies , viciousness and these do cause extensive damage. So it is not a matter of choice - combined with other variables ( political opponents , mediocre colleagues, obnoxiously selfish businessmen, anti national forces, economic challenges , population explosion etc ) there is clear and present danger to all nationalistic forces . And these will have to be check mated , outsmarted and put on the mat asap. i for one have never been able to understand that how come all these crooks of media ( till date ) are not being hounded, cornered for their deliberate lies, anti national stances, crooked views , false pitches - despite there being enough and sufficient evidence for many of their wrong doings . To begin with when did and which people appointed this idiots to be their spokesperson or care taker? Neither Modi government nor their spokespersons are obliged to give briefing to this Cosa Nostra. Bunch of these assholes has not acted as pillar of democracy but as props to dilapidated dynasty. 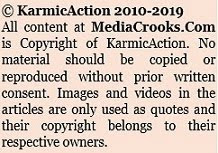 Preserve of democracy can never be copyright of such partisan gangsters called ‘Editors Guild’. In fact it is guilt they have committed by surrendering their pen, paper, screen and voice to previous corrupt rule and thereby hampered the progress of nation. They had been busy in Soniya’s songs, Rahul’s rhyming and Priyank’s paeans. Perverted secularism has been their schema. Yet they are not out of that dirty game. Suffice is to site two recent incidences of their duplicity, that topi-fame Mulla Mahendi Hassan who made stupid comment on Navratri got a slap from a person and attack on PETA activist woman in Bhopal. TV channels repeatedly shown the first incidence throughout a day whereas second incidence did not receive any attention by same TV channels. Because in first case secular (!) was victims whereas in second incidence seculars (!) were attackers. 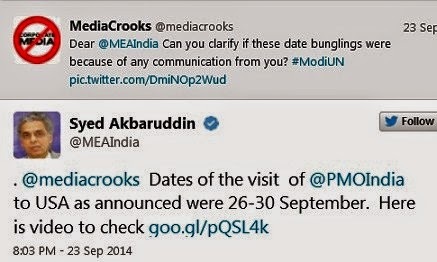 Narendra Modi directly talks with people he do not want media pimp in between. Unless this lot behave he is not going to give them a damn. These fools have not taken a lesson from the fact that when you could not succeed in your malicious campaign how you are going to put him down when nation has faith in him and he is on right track. Well written post exposing truth about broken pillars of scams in democracy. All the media crooks are in the US, singing praises of the same Modi, whom they have been demonising for the last 12 years! Excellent post which should be sent to Editors' Guild of India ! Kudos to you Ravinar ! !.I am running out of words to appreciate you. I would like to point out something that you seem to have missed. There was a debate conducted on 24th Sept night on NDTV (you might find it in YouTube). I was waiting for you article ever since I saw that. One of the participant in it was (no prizes for guessing): Abhishek Manu Singhvi. He went on to say that dictatorial streaks are showing through in his actions (not giving the media the access to the Bureaucrats). It made my blood boil. Yes, AXE alone should be the prize of justice for these nauseating subhumans for all the zeal with which they catered lies, lies & more lies to the Indian public for over a decade with impunity. "Editors Guild of India" is but a subsidiary of the "Indian Chapter of Rogues- Gallery". I am waiting to celebrate the day when some of these presstitudes are sent to Tihar and a few Publishing/Media houses shut shop in India. I am getting more and more restive each passing day at the inaction of the government in raiding these presstitude houses and booking them for their crims - financial and others. Another mischievous article in ET on Supreme Court declaring National Tax Tribunal Act 2005 as illegal. This article says NDA government justified the act. NDA government was gone in 2004 and the act came into existence in December 2005. Real Morons. his husband-wife duo, who continuously put Narendra Modi in the dock regarding the 2002 Gujarat riots, tried to start a new stream of journalism and their leanings to a specific political party was no secret. Neither did the due get rid of the Congress since their talk show and TV anchoring days. So when the man who is India’s biggest industrialist and close to Modi acquired control of the Media group, the duo that couldn’t stop talking about the Congress were given a farewell. After having faced unemployment for some time, the husband has got a position in English news channel. Where the wife is concerned, she has got the position of editor-in-large with a Delhi’s prominent English daily. Sources reveal that one day a phone call from the PMO was received by the owner of the newspaper who was informed that the “boss” is not happy with the way the group has eagerly given a job to the woman journalist. On the other hand, when another lady owner of a prominent newspaper group reached the PMO to meet a top official, she was told, “You used to appoint Editor in your newspapers on the advice of 10, Janpath, It would be better if you lose that habit.” And when a prominent columnist asked for time with the PM, he was asked to meet the PMO’s state minister Jitendra Singh and he was told, “You have written almost six dozen columns against Modi, if you are so against the person, why do you seek his time?” Clearly, identifying his friends and foes and knowing how to behave with each is something Modi knows well. In the interests of India, these news traders and presstitutes need to be sidelined for good. They are a cancer. Let honest and fair press emerge. The gutter gang is restless at the loss of influence. Scumbags. 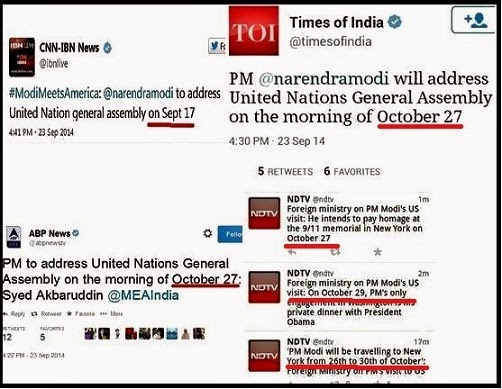 Must be only in India where leading media outlets botch up their own country's leader's important schedules. Such mischief could cause security problem to the leaders. In America Fox News Channel is extremely anti-Obama. But have never heard them botching up Obama's schedule. Whose editors they are! When did they command respect, last! Hope we could prepare a crisp joint statement against them. A prostitute sells her body for money. A pressitude sells his mind for money! Jab Dhartee Lagee phatnee to prashad lage batnee. These scoundrels need to get a slow death. A lot of persons like me are no longer viewing the TVs for news and instead turn to Social Media, Twitter and FB. But these media people, enter there also, and confuse us. I am now following in Twitter, all Government Departments and PMO also and know the news. I think Govt. planning FMs, the penetration will be complete sans the TVs. 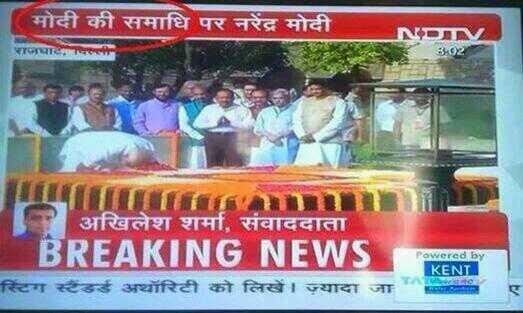 Thereafter, they will realise and telecast correct news. The job is only half done by doing that. There are many ignorant people around you who need to be educated against the dangers of blindly believing MSM. We must wake up these people too. It is our duty to spread this message to everybody who listens. IN the UK we have 20 plus TV channels on ISLAM these are free to view. I wonder who is funding these channels. In India we need a Nationalistic and Hindu leaning TV channel on the lines of FOX in US. This disease of pseudosecularism has spread all over the western world. We need to wake up to the danger around us.